German theologian; born at Prague Sept. 30, 1801; died at Breslau Feb. 13, 1875. 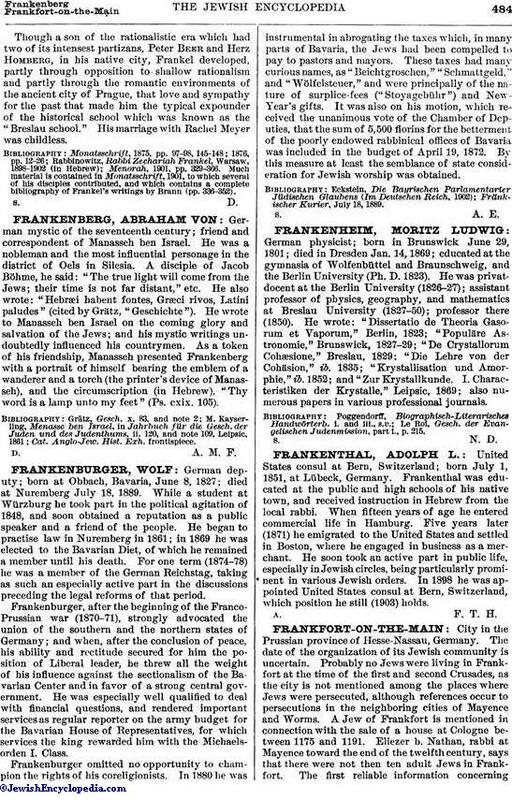 Frankel was the founder and the most eminent member of the school of historical Judaism, which advocates freedom of research, while in practical life it upholds the authority of tradition, Frankel was, through his father, a descendant of Vienna exiles of 1670 and of the famous rabbinical Spira family, while on his mother's side he descended from the Fischel family, which has given to the community of Prague a number of distinguished Talmudists. He received his early Talmudic education at the yeshibah of Bezalel Ronsperg (Daniel Rosenbaum); in 1825 he went to Budapest, where he prepared himself for the university, from which he graduated in 1831. In the following year he was appointed district rabbi ("Kreisrabbiner") of Leitmeritz by the government, being the first rabbi in Bohemia with a modern education. He made Teplitz his seat, where the congregation, the largest in the district, had elected him rabbi. He was called to Dresden in 1836 as chief rabbi, and was confirmed in this position by the Saxon government. In 1843 he was invited to the chief rabbinate at Berlin, which position had been vacant since 1800, but after a long correspondence he declined, chiefly because the Prussian government, in accordance with its fixed policy, refused to officially recognize the office. He remained in Dresden until 1854, when he was called to the presidency of the Breslau seminary, where he remained until his death. The atmosphere of Prague was wholly favorable to the development of the romantic love for the past that is at the bottom of the principle of historic Judaism which Frankel advocated. He furthermore held firmly the belief that reason based on scholarship and not mere desire on the part of the laity must be the justification for Reform. In this sense Frankel declared himself when the president of the Teplitz congregation expressed the hope that the new rabbi would introduce reforms and do away with the "Missbräuche" (abuses). He stated that he knew of no abuses; and that if there were any it was not at all the business of the laity to interfere in such matters (Brann, in his "Jahrbuch," 1899, pp. 109 et seq.). Still he introduced some slight modifications in the worship, as the abrogation of the piyyuṭim, the introduction of a choir of boys, and the like. He was, however, strenuously opposed to any innovation which was objectionable to Jewish sentiment. In this respect his denunciation of the action of the "Landesrabbiner" Joseph Hoffmann of Saxe-Meiningen, who permitted Jewish high-school boys to write on the Sabbath, is very significant ("Orient," iii. 398 et seq.). His position in the controversy on the new Hamburg prayer-book (1842) displeased both parties; the Liberals were dissatisfied because, instead of declaring that their prayer-book was in accord with Jewish tradition, he pointed out inconsistencies from the historical and dogmatic points of view; and the Orthodox were dissatisfied because he declared changes in the traditional ritual permissible (l.c. iii. 352-363, 377-384). A great impression was produced by his letter of July 18, 1845, published in a Frankfort-on-the-Main journal, in which he announced his secession from the rabbinical conference then in session in that city (see Conferences, Rabbinical), and stated that he could not cooperate with a body of rabbis who had passed a resolution declaring the Hebrew language unnecessary for public worship. This letter made Frankel one of the leaders of the conservative element. In opposition to the rabbinical conferences, he planned conventions of scholars. His principles were enunciated in his monthly "Zeitschrift für die Religiösen Interessen des Judenthums," which he published from 1844 onward. But Frankel's conciliatory attitude was bound to create for him enemies in the camps of the extremists on both sides, and such was the case with both Abraham Geiger and Samson Raphael Hirsch. As the man of the golden mean Frankel was chosen president of the new rabbinical seminary at Breslau (Aug. 10, 1854). Geiger, who had inspired Jonas Fränkel, the president of his congregation, to found this institution, opposed the appointment vigorously,and when the examination questions given by Frankel to the first graduating class appeared, Geiger published them in a German translation with the evident intention of ridiculing the casuistic method of Talmudic instruction (Geiger, "Jüd. Zeit." i. 169 et seq.). Samson Raphael Hirsch, immediately on the opening of the seminary, addressed an open letter to Frankel, demanding a statement as to the religious principles which would guide the instruction at the new institution. Frankel ignored the challenge. When the fourth volume of Grätz's history appeared Hirsch impeached the orthodoxy of the new institution (1856), and his attacks became more systematic when Frankel in 1859 published his Hebrew introduction to the Mishnah. The first attack began with the letter of Gottlieb Fischer, rabbi of Stuhlweissenburg, published in Hirsch's "Jeschurun," 1860. 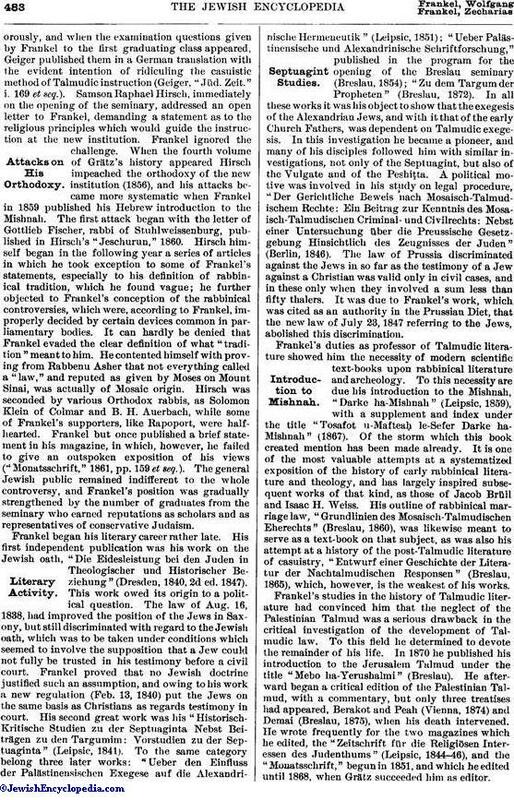 Hirsch himself began in the following year a series of articles in which he took exception to some of Frankel's statements, especially to his definition of rabbinical tradition, which he found vague; he further objected to Frankel's conception of the rabbinical controversies, which were, according to Frankel, improperly decided by certain devices common in parliamentary bodies. It can hardly be denied that Frankel evaded the clear definition of what "tradition" meant to him. He contented himself with proving from Rabbenu Asher that not everything called a "law," and reputed as given by Moses on Mount Sinai, was actually of Mosaic origin. Hirsch was seconded by various Orthodox rabbis, as Solomon Klein of Colmar and B. H. Auerbach, while some of Frankel's supporters, like Rapoport, were half-hearted. Frankel but once published a brief statement in his magazine, in which, however, he failed to give an outspoken exposition of his views ("Monatsschrift," 1861, pp. 159 et seq.). The general Jewish public remained indifferent to the whole controversy, and Frankel's position was gradually strengthened by the number of graduates from the seminary who earned reputations as scholars and as representatives of conservative Judaism. Frankel began his literary career rather late. His first independent publication was his work on the Jewish oath, "Die Eidesleistung bei den Juden in Theologischer und Historischer Beziehung" (Dresden, 1840, 2d ed. 1847). This work owed its origin to a political question. The law of Aug. 16, 1838, had improved the position of the Jews in Saxony, but still discriminated with regard to the Jewish oath, which was to be taken under conditions which seemed to involve the supposition that a Jew could not fully be trusted in his testimony before a civil court. Frankel proved that no Jewish doctrine justified such an assumption, and owing to his work a new regulation (Feb. 13, 1840) put the Jews on the same basis as Christians as regards testimony in court. His second great work was his "Historisch-Kritische Studien zu der Septuaginta Nebst Beiträgen zu den Targumim: Vorstudien zu der Septuaginta" (Leipsic, 1841). To the same category belong three later works: "Ueber den Einfluss der Palästinensischen Exegese auf die Alexandrinische Hermeneutik" (Leipsic, 1851); "Ueber Palästinensische und Alexandrinische Schriftforschung," published in the program for the opening of the Breslau seminary (Breslau, 1854); "Zu dem Targum der Propheten" (Breslau, 1872). In all these works it was his object to show that the exegesis of the Alexandrian Jews, and with it that of the early Church Fathers, was dependent on Talmudic exegesis. In this investigation he became a pioneer, and many of his disciples followed him with similar investigations, not only of the Septuagint, but also of the Vulgate and of the Peshiṭta. A political motive was involved in his study on legal procedure, "Der Gerichtliche Beweis nach Mosaisch-Talmudischem Rechte: Ein Beitrag zur Kenntnis des Mosaisch-Talmudischen Criminal-und Civilrechts: Nebst einer Untersuchung über die Preussische Gesetzgebung Hinsichtlich des Zeugnisses der Juden" (Berlin, 1846). The law of Prussia discriminated against the Jews in so far as the testimony of a Jew against a Christian was valid only in civil cases, and in these only when they involved a sum less than fifty thalers. It was due to Frankel's work, which was cited as an authority in the Prussian Diet, that the new law of July 23, 1847 referring to the Jews, abolished this discrimination. Frankel's duties as professor of Talmudic literature showed him the necessity of modern scientific text-books upon rabbinical literature and archeology. To this necessity are due his introduction to the Mishnah, "Darke ha-Mishnah" (Leipsic, 1859), with a supplement and index under the title "Tosafot u-Mafteaḥ le-Sefer Darke ha-Mishnah" (1867). Of the storm which this book created mention has been made already. It is one of the most valuable attempts at a systematized exposition of the history of early rabbinical literature and theology, and has largely inspired subsequent works of that kind, as those of Jacob Brüll and Isaac H. Weiss. 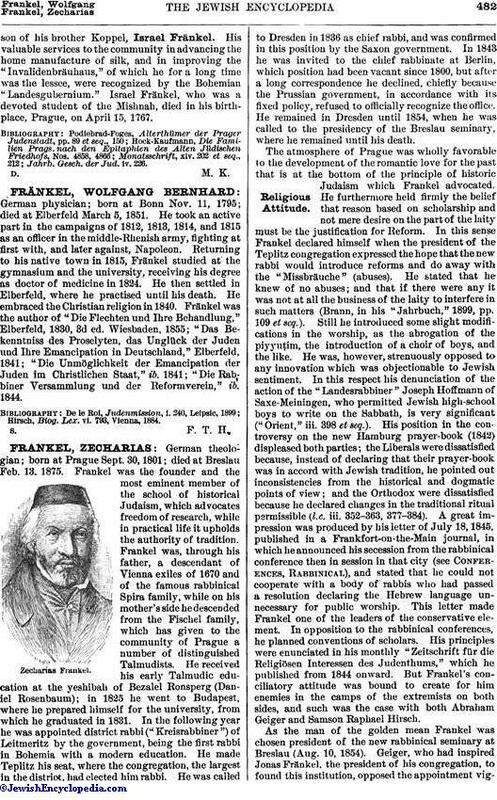 His outline of rabbinical marriage law, "Grundlinien des Mosaisch-Talmudischen Eherechts" (Breslau, 1860), was likewise meant to serve as a text-book on that subject, as was also his attempt at a history of the post-Talmudic literature of casuistry, "Entwurf einer Geschichte der Literatur der Nachtalmudischen Responsen" (Breslau, 1865), which, however, is the weakest of his works. Frankel's studies in the history of Talmudic literature had convinced him that the neglect of the Palestinian Talmud was a serious drawback in the critical investigation of the development of Talmudic law. To this field he determined to devote the remainder of his life. In 1870 he published his introduction to the Jerusalem Talmud under the title "Mebo ha-Yerushalmi" (Breslau). He afterward began a critical edition of the Palestinian Talmud, with a commentary, but only three treatises had appeared, Berakot and Peah (Vienna, 1874) and Demai (Breslau, 1875), when his death intervened. He wrote frequently for the two magazines which he edited, the "Zeitschrift für die Religiösen Interessen des Judenthums" (Leipsic, 1844-46), and the "Monatsschrift," begun in 1851, and which he edited until 1868, when Grätz succeeded him as editor. Though a son of the rationalistic era which had two of its intensest partizans, Peter Beer and Herz Homberg, in his native city, Frankel developed, partly through opposition to shallow rationalism and partly through the romantic environments of the ancient city of Prague, that love and sympathy for the past that made him the typical expounder of the historical school which was known as the "Breslau school." His marriage with Rachel Meyer was childless. Much material is contained in Monatsschrift, 1901, to which several of his disciples contributed, and which contains a complete bibliography of Frankel's writings by Brann (pp. 336-352).